This week Victoria's Secret Angel, Romee Strijd unveiled Victoria's Secret's latest fragrance, xo, Victoria in New York City. Inspired by the refreshing energy of springtime, xo, Victoria is a free-spirited twist on the original Victoria fragrance. xo, Victoria's irresistible floralcy was built around the pairing of the trademarked Victoria Rose accord and sparkling Twilight Orchid, an exotic floral scent that can only be captured at nightfall. The stunning supermodel Romee is the face of the brand's newest scent. Do you think we will look like her if we spray ourselves? Well, at least we can smell like her. A little more detail about the new Victoria Secret fragrance: Sparkling citrus notes and Lady Apple give it a sunny feel, while hints of English Ivy add woody warmth. The white lacquer bottle is a bright, fresh take on the original: splashed with vivid watercolor blooms and accented with the iconic handcrafted Victoria bow, reinvented for spring in modern, frosted white. The fragrance collection includes: Eau de Parfum 1.7 oz. / $52, Eau de Parfum 3.4 oz. / $68; Body Lotion, 8.4 oz. / $25; Body Mist 8.4 oz. / $25 and Rollerball, .25 oz / $18. So, if you are wondering, “where can we buy xo, Victoria?”, the answer is that the xo, Victoria collection is available online at their website and in Victoria's Secret stores. 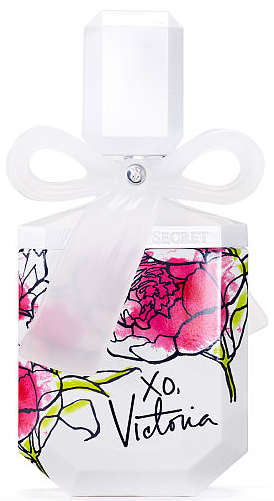 See more Victoria's Secret fragrances. If you are interested in seeing beautiful like Romee but not an actual fashion model, you may want to read our recent Megan Fox vibe post. It is not relevant to this fragrance, but it may be another post of interest to you. Thank you for taking the time to read our perfume blog post. We hope that you have found this fragrance news to be informative. If you have comments or questions, please add your thoughts in the discussion area below.